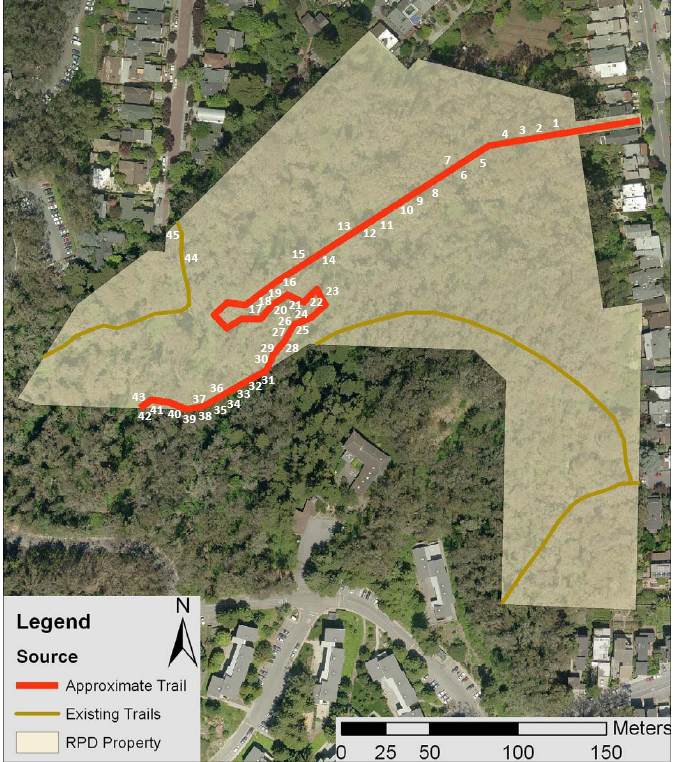 ← A Bobcat in Sutro Forest? 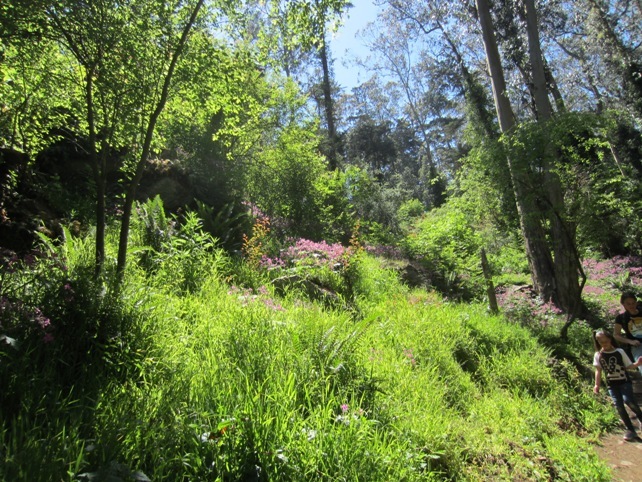 Spring in the Sutro Forest is lovely. Where the canopy is largely unbroken, the sunlight streams through the trees with the filtered light particular to forests. 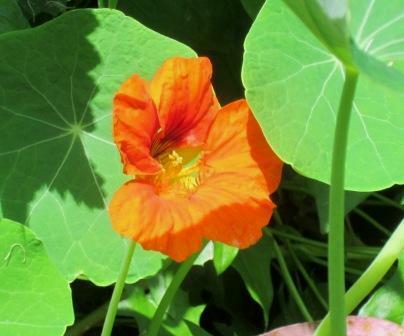 Last week, flowers bloomed in the lower reaches of the mountain: the pinkish-purple Robert Geranium, some tiny fairy bells (Disporum smithi) hidden under their leaves; some fringe-cups; some brilliant nasturtiums peeking out; yellow-orange abutilons. The trails were dry then, though a couple of foggy nights since may have damped them down again. We started our walk in the forest from Stanyan and 17th, the “Kill-Trees Trail.” It’s a good trail; it provides easier access to the forest from its east side – where street parking is available. And it’s a beautiful part of this woodland. It’s changed the character of the forest. Houses are visible through the trees, and several huge old trees that once guarded the trail entrance are gone, and with them, the sudden magical transition from city to forest. Now it’s more gradual, with a view of houses across in Edgewood and Woodland Avenues, and into the nursery that’s been there for a couple of generations and was resplendent with Pride of Madeira. “They look Jurassic,” someone commented. 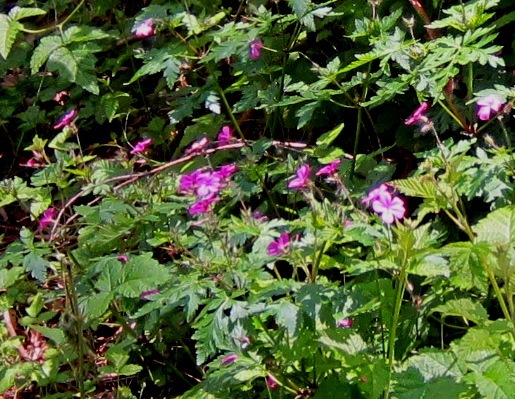 The canopy has been opened up, which has encouraged some flowering plants, particularly the Robert geranium, but also fringecups, elk clover – and poison oak. The undergrowth has recovered from the weed-whacking it endured soon after the trail-building. The blackberry thickets have recovered; for some months, this area had been carpeted only with a shallow layer of Cape Ivy. There’s still ivy, climbing the columns of the trees and providing crucial habitat for the birds. The best news is, the birds are back. For about a year, the forest has been uncharacteristically quiet; possibly a combination of the frequent disturbance and the understory destruction discouraged them. But last week, the forest was again bright with bird-sound. 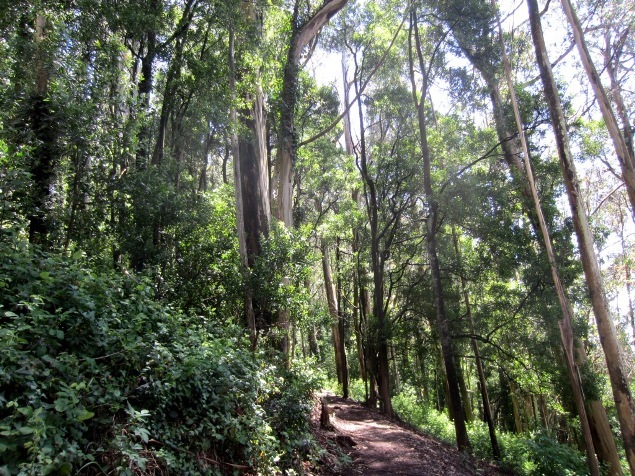 This entry was posted in Mt Sutro Cloud Forest and tagged birds, opening up the forest, Sutro Forest, trails. Bookmark the permalink. Some years ago (1973-95) I was living near 17th and Clarendon–working at UCSF, and using the sidewalk up Clarendon by UC housing, then using what I called the “contour trail” — neither up nor down, but across the forest. 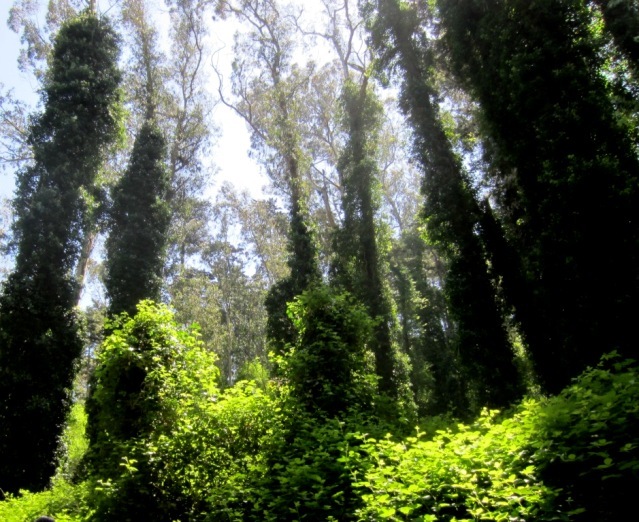 The trail, an old Sutro wood-gatherers trail, I’m told, was in very bad shape — a rocky gap to be leaped, often muddy, strangled with blackberries and poison oak, and at its return to the main road – a steep embankment. Using many tools (clippers, mattock, sledge hammer on the rocks, and shovels) I cleared a walkable path and hacked out usable steps on the north end. It was consequently used by many from the housing units. Some great folks have now really worked this route to give a fine walk in the forest. INCIDENT: the wife of a then Chancellor, living in the Chancellor’s home, had decided that her view of The City was inconveniently blocked by several trees. September: she ordered several eucs to be removed, but leaving some pine trees (her favorites). This was done, leaving some gaps in the forest. November: a huge windstorm arose. Four or five pines, formerly so carefully guarded by the eucs, crashed to the ground. The result caused great consternation among the forest lovers –and caused the University a lot of money to remove the carcasses. WARNING: LEAVE THE EUCALYPTUS TREES ALONE OR SUFFER UNANTICIPATED CONSEQUENCES.